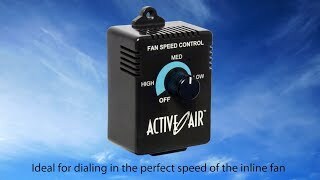 It will correctly and precisely adjust the speed of centrifugal fans. These controllers are more sensitive than any on the market, and are compact and built to last. Specifically made for use with centrifugal fans. Correctly manipulates input power sine wave for type of motors being controlled. Made for routers (different style of motor). Incorrect clipping of input power sine wave leads to shorter fan life and excessive noise. Higher sensitivity control allows precise flow adjustments. Low resolution voltage control doesn’t allow for proper adjustment of flow. Stall speed range eliminated to eliminate fan stoppage. Allows fan to stall if fan speed falls. Internal self-resetting circuit breaker in case of over-voltage. Must manually replace fuse and/or reset breaker switch, possibly leading to a scenario where your fan isn’t running for an extended period of time. NOTE: Use only with ball-bearing inline/centrifugal fans. Not recommended for use with "squirrel cage" type fans or the 12" Max Fan. For the 12" Max Fan, use speed controller CFH0350290.